I've only had 2 days of follistim, so I knew that there wouldn't be any break-out follicles yet, but overall, I was pleased with my scan this morning. 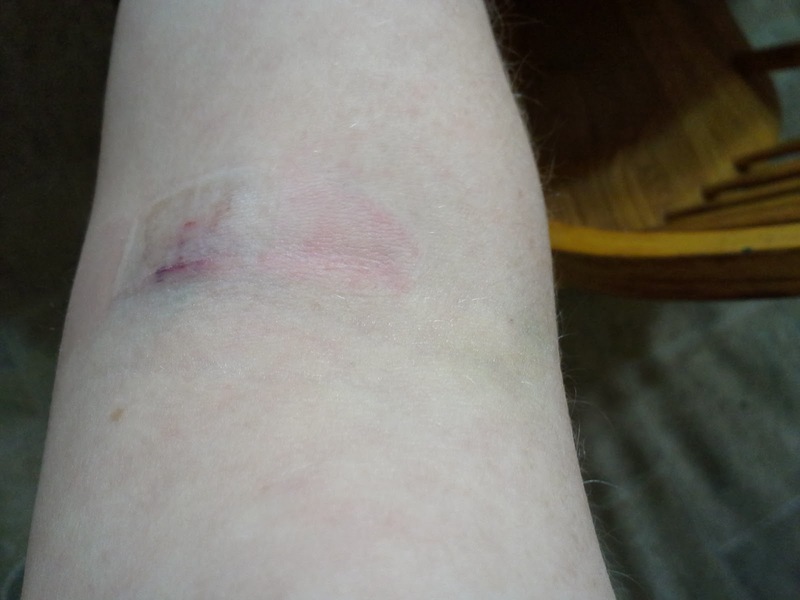 The blood draw, not so much. The scan showed that I had no leading follicles yet, but my lining was just over 7mm and just beginning to be triple layer, so I knew my estrogen was rising. Results came back at 215.2 and I'm taking 125units of follistim tonight and tomorrow with another u/s and labs on Tuesday. Getting the blood to run my E2 lab was HORRIBLE. I tried to drink lots of water yesterday to make the draw easier, but apparently I didn't drink enough. I first got stabbed on the left, but to no avail, so it was over to the right. I have 2 visible veins on my left arm. When I went in last Wednesday, they used one of them, so she tried the other one today. While she got the blood for the lab, she seriously injured me. You can see the faint bruise on the right from the labs on 1/8. You probably can't see the big lump on the left from today. My arm still hurts, even 12 hours after the blood draw, it's still a big lump and I don't know how I'm going to keep getting blood draws when that entire vein is now out of commission. I should note that I do not like blood draws. I used to be fine with blood draws, but haven't been since about 2000. When I have blood draws now, I have to close my eyes, focus on my breathing, pretend I'm not there and try not to break out in a sweat, get anxious or get nauseous. I'm going to try icing 3 times per day, but my body can only heal so fast. Any suggestions on healing tips or things I can do to improve chances of good blood draws? Ask them to use a butterfly needle. Smaller gauge, easier for you butbharder time wise for them. Also worse to worse they can do a draw from the back of yourbhand.